Again I have had a hectic day and will write about another of the 4 antique drawn thread squares I inherited from my grandmother. I think this is the most interesting one. It looks like most of the threads were removed leaving relatively few to anchor the design. 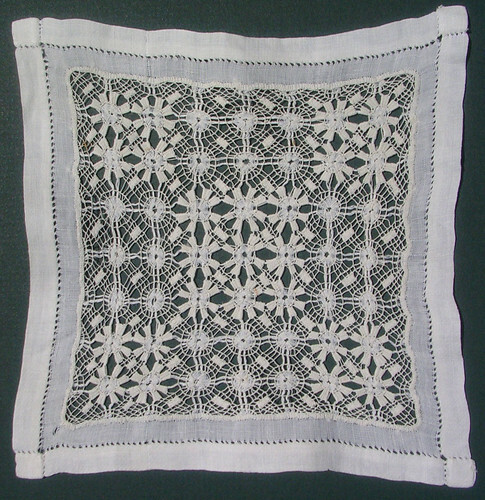 The design is mostly worked in needlelace. I can see the needle weaving, but I am not sure of the technique used to go around in the circles. I love the look of the overall design of this piece. I wonder if the stitcher followed a pattern or made up the design herself. Someday I hope to learn to make drawn thread lace. I will most likely follow a much simpler pattern. This entry was posted on Wednesday, December 24th, 2008 at 3:00 am and is filed under Embroidery and Lace. Tagged: Drawn-thread, Embroidery, Fabric, Needlelace, Needlework, Thread. You can feed this entry. You can leave a response, or trackback from your own site.